The holiday season isn't even waiting for a proper chill to set in in much of the country, but that's not necessarily a bad thing - especially for those of us getting our shopping done early, and from a laptop or phone in air-conditioned splendor. We're seeing plenty of deals already on tech and household items, and here are a few of our favorites. From geek tech to next-gen can coolers, there's something from every wish list. If you've got an especially tidy or overworked Star Wars fan, this is the droid you're looking for. Upgraded with CycloneForce tech, this suctioning soldier will clean up any corner of your empire, and its Visionary Mapping feature makes sure it won't get hung up on obstacles. This POWERbot was originally $699, then dropped to $372, and currently sits at $349.99. It won't be there long, so pick one up. We completely understand having an attachment to the old cassette tapes that kept our heads banging through road trips of yore. But time will not be kind to that medium, so keep the music alive with this easy rig that converts those old tapes to audio files for a new life on your computer or phone. The Audio Cassette to MP3 Music Converter is already 70% off at $20.99, but you can save an additional 20% off with the code BFSAVE20. Here's a starter guitar that won't be their last. 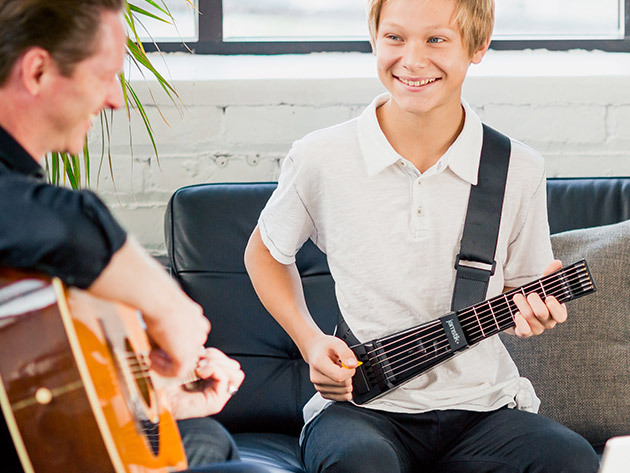 The Jamstik+ pairs with an app to teach how to play by way of lessons and games that will unleash their inner Jack White. No tuning and no bulky gear - just a limitless amount of music wherever you need it. The Jamstik+ Portable Smart Guitar is $269, which is a drop from the already sale-priced $279.99. For the audiophile on your list, this sturdy set of headphones focuses on quality with a novel approach, packing three drivers into each earpiece for hyper-realistic sound. With a collapsible design and braided Kevlar cords, this is one set they'll want to take anywhere. The 1MORE Triple Driver Headphones are already 28% off at $179.99, but you can take an extra 20% off by using the code BFSAVE20. For the eco-minded beach bum or trailblazer, this simple piece of tech will be a godsend. It's waterproof, shockproof and comes with adapters for Android or iPhone to easily charge up either in sunlight. The Universal Waterproof Solar Charger just went on discount at $10.99 from its previous sale price of $13.99, and shoppers can get an additional 20% off with the BFSAVE20 code. Here's the virtual private network that earned unprecedented accolades from PC Mag, CNET and many more for its strict no-logging policy and a wide array of server locations. Surf worry-free with global access and total anonymity. Choose your commitment: A subscription to NordVPN is on sale now at up to 79% off. That's a one-year subscription at $48, two-year subscription at $76.60, or three years at $107.55. Take an additional 20% off with code: BLACKFRIDAYVPN. Whether they're a budding Tarantino or just selfie-obsessed, this gimbal will level up your friends' video and photo game. You can take astounding pictures with remote focus control, and use the accompanying app to set up amazing trick shots in Sport Gear, Inception or other video modes. The MOZA Mini-Me Wireless Charging Smartphone Gimbal is currently 13% off at $94.99, and you can take an extra 20% off with the BFSAVE20 code. Good things in small packages don't come any better or smaller than these minimalist earbuds. They're durable enough for the gym and completely immersive with CVC noise cancellation. When a call breaks in or when you need to change tracks, one-touch operation ensures a smooth transition with no undue tapping on your ears. The Cresuer Touchwave True Wireless Bluetooth Earbuds have dropped for the holidays to $34.99 from their previous sale price of $44.99. Another affordable set of wireless sound that doesn't skimp on quality. 4.2 Bluetooth-equipped and IPX8 waterproofed, they're a workhorse set that can go up to 3 hours on a charge. The AirTaps Wireless Bluetooth Earbuds 2.0 have been knocked down to $36.99 from $99.99, and you can knock 20% off that price with the code BFSAVE20. On workouts or at work, this unassuming gadget aims to be the only water bottle you use. It comes with a replaceable alkaline ionizer that boosts the pH level of your water and adds minerals like calcium, zinc, and iron. Healthy skin, boosted immunity - the benefits go on and on. The Level Alkaline Bottle is already more than 50% off at $38.99, and buyers can get an additional 20% off by entering the code BFSAVE20. The name says it all. The multi-layered stainless steel container lowers temperatures on any beverage by up to 130 degrees in a single minute with no watering down, making for the perfect cup of white wine, iced coffee or more. The HyperChiller V2 Rapid Beverage Cooler is new at $29.99, and shoppers can enjoy an extra 20% off with the code BFSAVE20.